Blockchain came to our lives so fast, and we all need to keep up with the pace that this tremendous technology has. While more and more projects decide to implement blockchain into their platforms, we want you to understand what that blockchain is and how humanity can utilize it to revolutionize the way we live. First of all, let’s find out what this word means. We believe that the explanation should be easy, so everyone could understand what’s the deal with this technology and why it is so secure, so we’ll try to use fewer words and show you more examples. Once you make a transaction, the network automatically sends a notification to the network ‘accountant’ (in the blockchain, they’re called miners, and they validate every transaction). Accountants or miners rush to check whether you can afford this transaction. The first accountant/miner that validates and confirms the operation gets the reward in bitcoins. Once another accountant agrees that the validation is correct, everyone on the network updates the file with transactions (the ledger). These are the fundamentals that stand behind the blockchain technology. So basically, as you can see, there is no way someone can hack the network and edit or remove the transaction. Since the ledger (file of transactions) is distributed among all the network participants, there is no way some fraud will be able to sneak and do something. We’ve mentioned Bitcoins above, and it’s time for you to know the truth that there are many other cryptocurrencies besides the bitcoin. However, the most promising and the most successful one so far is Ethereum. The developer of this coin not only created a coin that can compete with Bitcoin, but also brought new technology to life. He designed and developed the smart contracts, and he believes that they can resolve many problems in our lives, help us eliminate the fraud from our lives forever and execute contracts more efficiently and transparently. Let’s take a closer look at how his technology works. 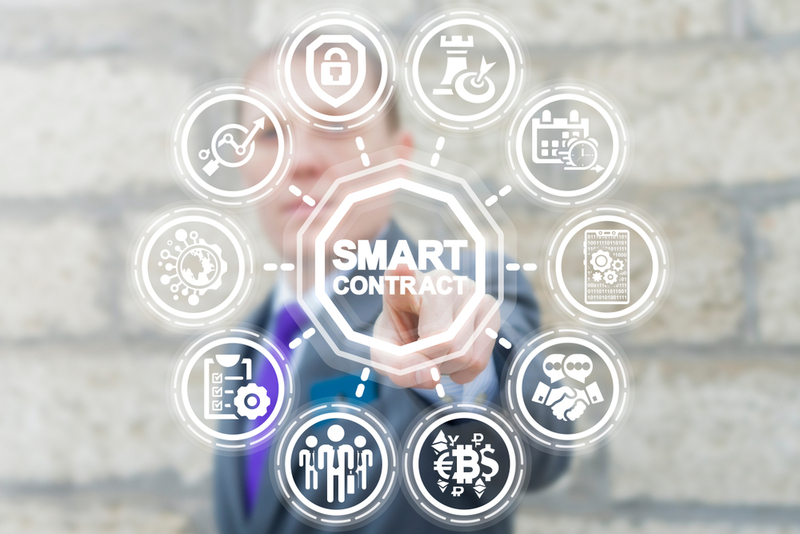 Smart contracts are designed to be self-executed when specific predefined criteria are met. They are created when someone starts the work according to the signed contract and then they’re executed at the end of the contract period. When they get self-executed, they usually activate some parameters that were mentioned during the contract creation. Primarily, the smart-contracts technology is currently utilized on Ethereum network. To make sure you understand how this works we will use a very popular comparison. Have you ever used a vending machine? The algorithm behind the work of the regular vending machine is quite simple. You put the money into the bog, select the product you like and tell the machine which one you’ve chosen by clicking an appropriate button. The machine checks if it has enough money in it from your transaction and determines whether it has to give you the product. Check whether the cash is fake or not, etc. At the end, when the machine is sure that all the criteria are met, it drops the product you’ve selected. Does it sound surprising to you? It shouldn’t, cause it’s very straightforward and easy to understand. That’s the principle that stands behind the smart contracts. Smart contracts are executed automatically. The terms and conditions are predefined, so it avoids the human errors. When we talk about the predefined conditions and terms, we need to highlight that all these details are visible to the public. Both sides can see them, but no one can dispute anything once the smart contract is created. Since there is no paperwork to deal with, these contracts are executed fast. No humans involved, just pure code operating according to the set of rules. It’s faster than light. Since smart contracts are operating on the blockchain, it’s fair to admit that they have the highest level of encryption ever designed and currently available. Crypto transactions are more secure than anything on the web today. You won’t need to sign anything physically, fax anyone the documents and wait for them to sign and send back. Even wanted to become a part of the ‘save the Earth’ movement? This is the best way to eliminate the paperwork from your life. Basically, smart contracts eliminate the need for courts. Since the contract executed itself upon the criteria are met, everything is done by the rules that both parties admitted to being fair in the first place. What industries can be revolutionized with smart contracts? More and more industries see newly created startups disrupting the whole industries by simply applying the basics of smart contracts technology on the real-life cases. We reviewed a few industries that are affected more significantly than other ones. The mortgage agreements themselves are not so complex, but there are so many middlemen who need to review the checks, the documents, etc. that it becomes a very lengthy and pricey thing. Studies say that implementing smart contracts and cutting off the middlemen in the mortgage industry can save billions of dollars annually. The rental industry has been in stagnation for years, but new technologies finally make it more attractive and fresher. Small startups try to move the whole process to the blockchain, but the most significant success is shown by the young long-term rental platform called Rentberry. This is the first decentralized platform that applies blockchain and smart-contracts to security deposits and rental payments. This looks very promising. Since the insurance industry is not automated enough to review the claims efficiently, people tend to get paid too late, and the claims are processed too long. Sometimes it takes months for you to get paid. Statistics show that it’s painful not only for the client but also for the insuring companies due to the large admin costs. Smart contracts can streamline the process of insurance payments. For example, they can trigger payments if some natural disaster happens in your area and your insurance covers it automatically. How soon can we see more use cases of smart contracts? Cryptocurrencies are still new to our lives, but humanity implements blockchain pretty almost in every new project, and this whole network is developed very fast. As of today, there are lots of great companies that offer a variety of services on the blockchain. Guys like Ark, Coinlancer, Cypherium, these startups are about to shake things up in our lives, so let’s get ready to hear some noise in the nearest future!